As a father, you've probably encountered the challenge of getting your kids to eat healthy meals and snacks. Between the stubborn insistence on eating junk food and refusal to eat nutritious items, children don't always make the best dietary choices. To help your kids grow strong and healthy, you need to take steps to instill positive eating habits. A few tips can help you get your children's diets on the right track. 1. Be selective with what food you purchase. If unhealthy food isn't in the house, kids won't be able to eat it. It can also be beneficial to provide an assortment of nutritious foods to choose from to encourage your children to make healthy food choices on their own. 2. Have meals as a family. This is a great way to both manage what your children are eating while influencing your children's tastes to lean toward healthy foods. There's also the added benefit of an occasion for communicating with your kids. 3. Manage portions. Try and keep serving sizes suitable to your children's ages and activity levels using the information on food packaging for a guideline. 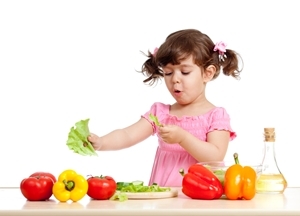 You don't want your kids to overeat, but you also don't want to deprive them of necessary nutrition.